Not every company has a multimillion dollar advertising budget to work with. And increasingly, even those that do are turning to more creative means of reaching their audiences. Many consumers have become averse to slick commercials and polished sales pitches over the years, causing savvy marketers to adapt with offbeat, attention-grabbing marketing campaigns. Following are 18 of the most memorable guerrilla marketing campaigns and what made them so effective. Few things irritate cell phone users as much as their calls being dropped mid-conversation. 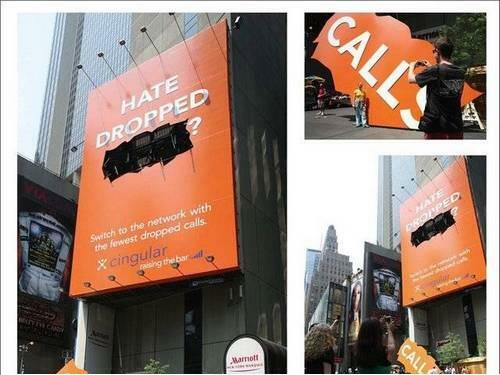 But rather than take to the airwaves, Cingular tackled the problem in true guerrilla spirit, and addressing this widely-felt problem in bold, dramatic, in-your-face billboard This ad, which portrayed a call being “dropped” onto the ground below, instantly arrested the attention of passers by and those far off who cannot help squinting to see what “that crazy looking billboard” was all about. Folgers took a page out of the guerrilla marketing playbook with this optical illusion of street art. Passersby on this city street see what appears to be a coffee mug embedded into the ground, emitting steam in your direction as you pass. Anyone who had decided to go without their morning brew will no doubt second guess themselves once they encounter this ad. Arguably the most famous in-your-face marketing campaign of all time is the Oscar Meyer wiener-mobile. Shaped as an enormous hot dog, the car makes its way across the nation, drawing attention from kids and adults alike as they watch the edible-looking vehicle lumber down the street. Entire songs have been written about the wiener-mobile, which has made appearances in TV shows and movies for decades since its launch. Profit-making corporations are hardly the only ones utilizing guerrilla marketing strategies. France’sMédecins du Monde, for example, expressed its commitment to fighting homelessness by distributing hundreds of tents to Paris’ vagrants in a maneuver nicknamed “tent city.” The huge cluster of tents quickly commanded public attention, to which the French government responded by allocating $10 million for emergency housing in response to the demonstration. Automaker Audi has had the daunting task of trying to sell diesel to the driving public as a viable and eco-friendly fuel, but on the strength of this ad, it has made quite a bit of headway. Operating under the tagline “Di*sel | It’s No Longer A Dirty Word”, Audi has aggressively marketed what is known as “clean diesel” to the marketplace according to GreenCarReports. Interestingly, the shift to clean diesel has also been sold as a means of achieving national energy independence – suggesting that Audi’s adoption of this tag line is not just a slick attempt to sell a car. 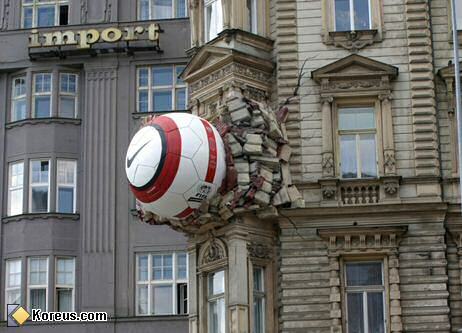 Some bright marketing manager at Nike knew that a huge soccer ball lodged into the side of a building would turn people’s heads. Perhaps designed to give the impression that soccer players would be infused with mind-blowing power if they used Nike balls, this is another prime example of creative marketing orchestrated in a way that appeals to the product’s very specific target audience, as well as everyone else. Sometimes the best way to get people’s attention is to get right in their way. The marketing team at Red Bull kept this in mind when masterminding this “pit stop” in the middle of Time Square in New York City. While myriad other advertisers waged the war for consumer mind-share on billboards and street lamps, Red Bull’s pit stop arrested everyone’s attention who so much as walked by down the street. The promotion turned out to be a huge success for word-of-mouth longevity. What better way to promote Superman Returns than by placing a twisted telephone pole in the middle of a busy city sidewalk? Even people with no interest in, or intention of seeing the movie, could not help but stop and inspect the pole. And, unlike commercials, it advertised the movie continuously at a fixed cost. Some big companies avoid guerrilla marketing campaigns, as what seemed like creative tactics in the planning stage, can sometimes be considered controversial when implemented. The “Vodafone streakers” offer a case-in-point: two guys who ran out onto the field during a New Zealand vs. Austria rugby game wearing nothing but the company logo painted across their bodies. The resulting public outrage was so fierce that Vodafone’s CEO had to issue a public apology and, and subsequently donated $30,000 to a local charity aimed at reducing sports injuries. Inappropriate, maybe. Effective, arguably. Some take to the airwaves, some take to the streets, and some take to the skies. Kia did the latter two in its nationwide campaign aimed at convincing consumers to “spend less” – on its brand of cars, of course. Accompanying the more flashy airplane-drawn ads were fliers stuck onto telephone poles with tear-away strips containing Kia offers and prices. While these “cheap” methods are typically used to promote apartments and tag sales, Kia reported a nice sales boost from its localized, targeted campaigns that accompanied the fancier plane-with-flags approach. Advertisers are known for making some pretty over-the-top claims about the products, but few pitches top the absurdity of using “heavy duty” Reynolds aluminum foil as a garage door. As the caption under the photograph states, the aluminum foil was installed in order to “demonstrate the product’s strength and toughness.” Cute advertising (and obviously effective since we’re still talking about it years later), though we question how long it would’ve withstood a serious attempt at breaking and entering. 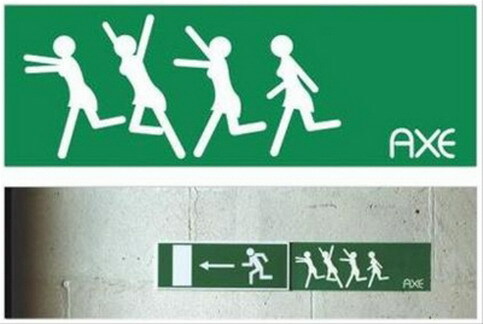 It’s tough to walk through a larger city these days without seeing one of the now famous Axe “running” ads. Plastered around cities across America, the ad suggests how women will flock to Axe wearers, due to the product line’s chick-magnet scents. Judging by brand’s recent popularity, the ads appear effective. Taking a page out of Oscar-Meyer playbook, cat food manufacturer Meow Mix developed the Meow Mix Mobile (pictured above), to cruise around spreading brand awareness on local streets and highways. As if that weren’t enough, Meow Mix also ran a reality TV show that put web-cams into a house full of cats so America could see what cats “really” do when people are not around. Perhaps no advertiser on this list went at it as aggressively as Half.com, who actually persuaded (and paid) an entire city to adopt “Half.com” as its new name. The move was a runaway success for Halfway.com, which, as Entrepreneur.com notes, earned a $300 million buyout from eBay in 2000 just five months following IPO. “Half the town”, however, was disgruntled with the web retailer for allegedly breaking promises made at the outset of the bizarre naming deal. One of the most recognizable of all campaigns is that of Goodyear. Seen on television, and throughout cities across America, the Goodyear blimp is a classic conversation starter, something that begs to be pointed out to anyone you happen to be walking, driving, biking, or talking with at the time it hovers overhead. The publicity generated for the tire company by this blimp over the years is incalculable and has inspired countless ripoffs ever since. Despite its noble goal of erecting the world’s tallest (real) frozen treat, Snapple’s foray into guerrilla marketing did not end well. After being pulled into upright position by a crane, the 80 degree heat rapidly began to melt the gigantic dessert, sending a veritable flood of strawberry-kiwi-flavored liquid down onto the streets of Manhattan. Insert your “sticky situation” joke here. In a truly brave move, Sony Corporation paid graffiti artists to adorn brick walls with Sony-themed images around New York City in attempt to drum buzz about the then-forthcoming PSP. While reaction to the street ads have been mixed, any company willing to knowingly break the law to advertise its product in such a creative manner (especially one as big as Sony) deserves mention in an article like ours. Rumor had it in the mid-90’s that Taco Bell had purchased the Liberty Bell and shamelessly re-named this important piece of American history as “The Taco Liberty Bell.” Hysteria was drummed up through ads like this (above), announcing the transaction in a convincing, matter-of-fact way. Some initially panicked, but in the end, everyone got that it was just a publicity stunt by the fast food chain – arguably a successful one.